The Demon is like an institution among ice fishermen. In fact, some anglers never use another jig style… instead, they keep a variety of sizes and colors on hand to catch any species at any time of year, anywhere. Yep, the Demon offers versatility in spades. The Demon’s design is deceptively simple, but don’t let that fool you. It’s built like a Sherman Tank, only smaller. Lots smaller. Beetle-shaped body… two-toned high gloss finish… Fluorescent-colored Demons feature a nickel back and Glow Brite finishes are painted on both sides. The Demon size 10 is the most popular panfish pick – and the size 12 is a premier ultra-light lure for finicky fish. Tipped with a single spike, the Demon 12 is a tremendous shallow water bluegill producer. 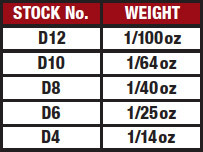 The Demon size 8 is great for perch and crappies or any fish species keying in on larger profile forage. Demon size 6 has the same size body as the size 8, but the size 6 hook will accept a larger minnow or other supersized bait options. 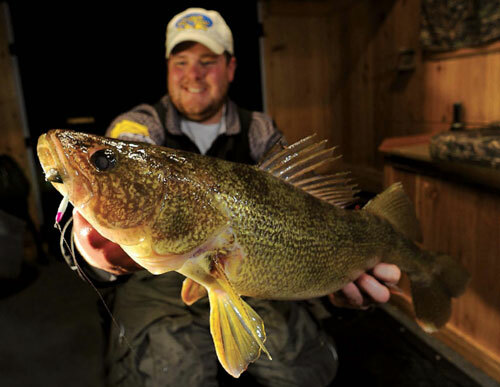 When fishing “eater” walleyes, the Demon size 6 will outproduce heavier, bulkier jigs on highly-pressured lakes. The largest size 4 is an excellent choice for chasing the bigger ’eyes, but make sure to balance your tackle! A Demon size 4 used with a whole minnow or minnow head on a medium-action rod and 6 pound test line, while a Demon size 12 used on a light rod with 2 pound test line. Size 4 is nearly unbeatable on a dead stick or jingle reel; size 12 is deadly on a long rod in shallow water. Don’t overlook the Demon for open water. Size 4 Demons in Glow Brite colors like GB7 are super effective for walleyes in dirty, high-water river situations or the tannic waters of the North. Tip it with a large fathead minnow or shiner and cast on light spinning tackle. Strikes can range from subtle taps to full-on reaction bites that nearly yank the rod from your hand! And don’t forget size 6 and 8 Demons for panfish! Worms, small leeches, minnows, waxworms and maggots make ideal partners to any Demon. I haven't been able to use it yet but lot of my buddies have. I love how you show the exact size by picture of Demon and size number. Great Hooks for Sunfish and Crappies. Nice color and solid jig.Works great. Great jigs for the ice! These are the best jigs I’ve found yet for ice fishing! Very pleased with the durability! This lure is amazing. It catches fish when others won't. The glow on this jig is super bright and lasts a long time. My only complaint I have is that the hooks have bent out on me on occasion. I'm not sure if I was just using a defective jig but it was a little frustrating to pull up a bent jig. My go to choice for catching slab gills. Custom Jigs and Spins is a great company with awesome customer support. Order arrived in 2 days ordering. I put an order every year to restock what was lost throughout the year, and have never been disappointed. This is my go to lure when panfishing . It works like a champ through the ice or open water.. Always have a few in the box.